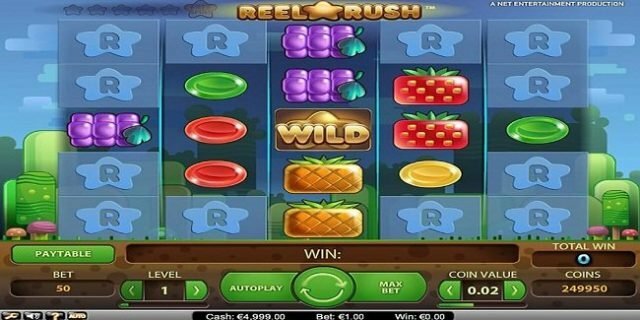 Reel Rush Slot is a video slot game powered by NetEnt software. This is 5 reels and 3125 Paylines slot game, which offers a jackpot of 1000 times of players total bet. Reel Rush Slot is a beautiful game. It is a colorful 3125-way video slot game. Players can try their luck at this casino slot game for free or with real money at many NetEnt Casinos. The wild card of the game is very easy to understand because it features the word ‘wild’. The five options available in this game are “Level”, “Coin Value”, “Max bet”, “Auto Play” and Spin” option. A player needs to adjust the level and coin value before hitting the spin button here. “Level’ means to adjust the bet level, “Coin Value” means to change the coin size, ‘Max Bet” is used to spin the reels at the maximum wager. “Auto Play” option is used to play the game many times in a row without interruption. Coin’s per line for the game ranges from 1 to 10. It means a player can adjust hit level using that option; while Minimum coins size is 0.01 and max coins size is 0.02. It means one can play Reel Rush slot for $£0.50 – $£100.00 a spin. Return of the player percentage for this game is 97, which is awesome. The 13 symbols of the game looks like sweets (candy) and they are very colorful like purple, green, and yellow, orange. A winning combination on any random spin may trigger 1 re-spin or up to 5 re-spins. Not just this, you can trigger additional 2 free-spins during your 1 free spin features.